FCI Lender Services, Inc. (FCI) is a leading national Private Money Servicer providing a variety of services for Lenders of any size, and is also one of the nation's oldest Specialty Loan Servicers. FCI has the distinction of being a national Tier One Rated Specialty Servicer (MORS 1) with a SOC1 (SSAE 16) audit verifying FCI's compliance for your safety. Clients include Individuals, Private Money Investors, Investment Companies, Private Money Brokers, Hedge Funds, Credit Unions and Banks. FCI is a California corporation founded in 1982 to offer California Foreclosure Processing and Loan Servicing to Mortgage Brokers and Private Investors. FCI grew rapidly through the acquisition of Loan Servicing and Foreclosure companies, including the transfer of over 2,000 private loans from Mercury Savings & Loan in 1988, and acquiring the Private Investor Division of Aames Home Loans with over 3,000 Private Investors in 1998. In 2002 FCI began expanding nationally and dramatically increasing its array of services for Private Investors, Hedge Funds, and Investment LLCs. Although working with Non-Performing Loans had always been a part of Private Money Servicing, FCI created a Specialty Loan Servicing Division in 2003 to specifically serve Clients who were buying Non-Performing Loans. FCI’s Specialty Loan Servicing Division offered Private Investors, Hedge Funds, Banks and Investment Brokers sophisticated collection and workout programs for a single Loan, or thousands of Loans, which included Financial Modeling to calculate workout scenarios and returns. 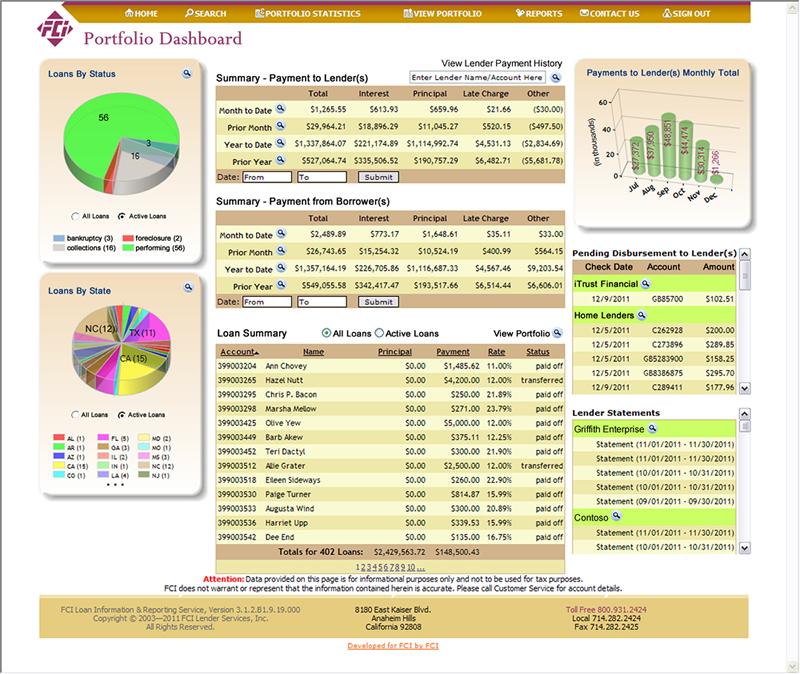 In 2004 FCI introduced the Live Customer Login where Clients could view the servicing activity on their Loans in real time, including watching payments come in, clear and be disbursed. Clients see Late Notices and Statements as generated, and even borrower collection notes as the phone calls happen. FCI's “Open Book Policy” gives customers live access to nearly all information in FCI’s Loan Servicing and Foreclosure Tracking systems. After the 2008 finance industry crash, FCI made the commitment to invest millions of dollars in systems and increased technology to deal with the coming onslaught of Federal and State regulations. We carefully used our attorney networks, contracted with data centers, and hired full time in house compliance supervisors and attorneys to keep on top of this new and constantly changing environment. In 2012 FCI became a Rated Servicer and began also working directly with State and Federal Banks on non-Agency loans, and acting as the chosen Servicer in major Collateral Funding Agreements and Securitizations of Private Money Loans. 2016 marked the milestone where FCI became the first Specialty Servicer to receive the Morningstar Credit Ratings tier one Rating. FCI is recognized as a premier national Private Money services provider, with over $10 Billion under management and the motto: all processed one Loan at a time. Our mission at FCI Lender Services is to serve as a premier complete national Private Money Servicer for Lenders. FCI is the Sub-Servicer acting at the direction of its Lender Clients offering Private Money Lenders, Hedge Funds, Investment Companies, Private Money Brokers, Banks, Credit Unions and Private Money Loan Servicers an all-inclusive outsourcing alternative for Loan Servicing, Collection, and Default processing of their Private Money Loans. FCI strives to deliver great efficiencies and cost savings to our Clients by using some of the finest personnel and technologies in our industry. At FCI we fully understand our relationship to both Borrower and Lender on a Private Money Loan, and promise to embrace our responsibilities with knowledge, courtesy, and integrity. The FCI Staff includes some of the most experienced and qualified management and operational personnel in the Lending and Servicing industry. Operational Staff are carefully screened, tested, and put through extensive task specific and cross training. Training continues in all areas to keep Staff and Management current with the constantly changing parameters of this industry. FCI employees are loyal and committed to the company, as many of them have been part of the FCI team for over 16 years. The Management at FCI includes many outstanding and recognizable people in the industry. The 14 members of FCI's Senior Management Team average over 27 years of servicing and workout experience each, and have impressive industry Resumes. Experienced Management and Staff are key to providing the high level of service and operational expertise that sets FCI apart. FCI has an industry wide reputation for providing hands on professional services as a Servicer for Lenders. We are a “partner you can trust” and not an impersonal, inflexible processing factory. FCI has established an outstanding industry reputation and high degree of trust in its ability to service and collect Private Money Loans, effectively handle Private and Institutional Loss Mitigation and Foreclosures coordination at the direction of Lenders during the past 36 years.